Article for WIRED magazine’s “The Wired World in 2018”, British Edition, pages 41-42. Interview with Kechil Kirkham, Industrial Astronomer and weekly host. Find out about gravitational waves and the latest news about their detection from one of the visiting scientists at LIGO, Kai Staats. In How music helps us learn Kai Staats shares how the musical score is an integral part of horror, drama, fantasy and sci-fi. We anticipate that the instruments will amplify our emotions, carry our mood from scene to scene. Yet, documentaries are often devoid of the careful application of score. If we apply the same techniques, the same instrumentation, we not only keep the audience engaged but help the viewer retain the information given. Marco Cavaglia, Professor Physics at the University of Mississippi and Assistant Spokesperson for the LIGO Scientific Collaboration presents “LIGO detector characterization with Genetic Programming” in which we apply GP to categorization of LIGO noise and show that it can effectively be used to characterize the detector non-astrophysical noise both in low latency and offline searches. The MSc thesis for Kai Staats, University of Cape Town, South Africa. At the time of this research, the application of machine learning to radio astronomy was relatively new. Genetic Programming had never been applied, and as such, was a novel approach to this challenging arena. Foundational to this body of research, the application Karoo GP was developed and tasked with the classification of signal verus radio frequency interference (RFI). The training data was derived from the output of an observation run of the KAT-7 radio telescope array built by the South African Square Kilometre Array (SKA-SA). Space Colonization by All Sides with Ann Fisher, with guests Dr. Paul Sutter (OSU CCAPP), Fraser Cain (Universe Today), Katherine Gorringe (documentary filmmaker), and Dr. Pete Roma (NASA HI-SEAS). Discussed is space travel, life on Proxima B, and the HI-SEAS one year mission. Genetically optimized weather predictions built upon the Southern African Large Telescope (SALT) weather monitoring database. This remarkably simple approach developed principally by head astronomer Stephen Potter derives a functional weather predictor in order to prepare dome environment conditions for night time operations or plan, prioritize and update weather dependent observing queues. Hosted by Fraser Cain, a live video interview with Kai Staats and Michael Landry, lead detection scientist at LIGO, Hanford. About filmmaking, the second LIGO detection of merging black holes, and translating science for the public audience. “Why Does Mars Matter?”, an interview by Victoria Young for the South African based blog site which “explores the space between” in speaking with writers, artists, inventors, designers, filmmakers, chefs, scientists and travellers. Recorded at the South African offices of the SKA, we discuss filmmaking, surfing, living on Mars, underwater cities, civil war, a brief history of human migration, beans on toast, and of course, streaking in a low pressure atmosphere. “Detecting Ripples in Space-Time, with a Little Help from Einstein”, co-authored with astrophysicist Marco Cavaglia, University of Mississippi. The Committee on Human Spaceflight (NASA Authorization Act of 2010) requires that the National Academies perform a human spaceflight study [to] review “the goals, core capabilities, and direction of human space flight” … this language reflects concerns that—without an accepted and independent basis for the establishment of long term goals—political cycles and other factors would continue to drive instability in the human spaceflight program. Download “Real Heroes: A Case for Continued U.S. Involvement in Human Space Exploration” by Kai Staats and Gaurav Khanna, Ph.D. Humanity & Technology is a column I wrote for MacNewsWorld (’04) and Northern Colorado Business Report (’10-12). Not a comparison of the speed of the latest wifi networks, but an introspective look at the effect of deeper integration of technology into the human experience, bringing to focus how our interaction with technology affects our relationship with each other, how it shapes the social evolution of our species. 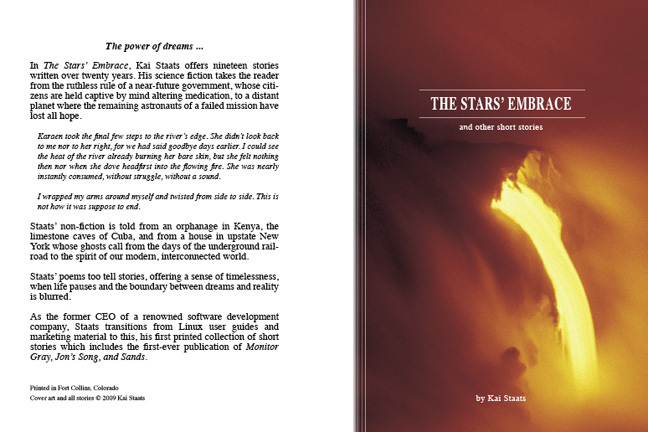 In The Stars’ Embrace, Kai Staats offers nineteen stories written over twenty years. His science fiction takes the reader from the ruthless rule of a near-future government, whose citizens are held captive by mind altering medication, to a distant planet where the remaining astronauts of a failed mission have lost all hope. 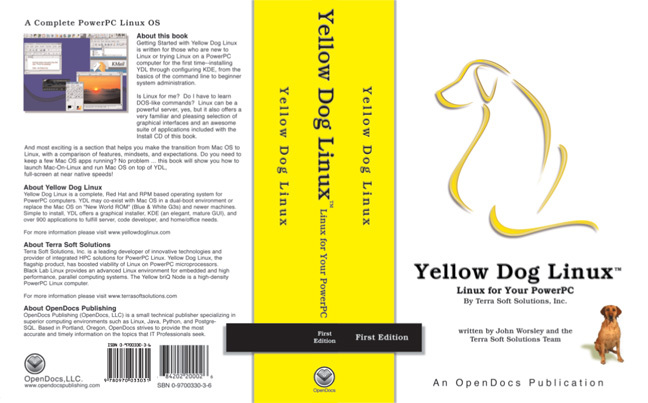 First published in 2002 by OpenDocs Publishing, Getting Started with Yellow Dog Linux was written for anyone interested in running Yellow Dog Linux on a PowerPC computer, with emphasis on Apple computers. This book introduced the reader to Yellow Dog Linux, regardless of previous familiarity with Linux, enabling comfort and familiarity with the daily use of Linux, both in the graphical interface, and if desired, at the command line. “Getting Started” went into 2nd, 3rd, and 4th publications, each edition updated for the latest advancements of the Linux Desktop.